I am a private Owner and not an Agency. PLEASE, before you make a direct booking request (filling out your CC details), please send me a first message (Ask a question/ contact the agency). I will send u a complete brochure of the house/place and everything u need to know before u book. Lovely independent villa in Elba Island, on the coast between Marciana Marina and S.Andrea, just in the middle of Tuscany Islands National Park, in a quiet and charming place with enchanting sea lookout (sea view from terraces and all bedrooms windows). Equipped with large roofing terraces, tables, cradles and barbecue for an agreeable outdoor life the villa is elegantly furnished and accurately maintained. for large groups or guest slooking for a comfortable accomodation. The dependance (named Torara) is just on demand. All the bedrooms (dependance included) have an enchanting window's seaview. The location is the ideal starting place for sea life but also for charming trekking through forests, valley and mountains of Elba Island Natural Park and for visiting medieval villages in the nearby. Quality of your stay will be guaranteed by comfortable accommodation and wonderful villa's location. It is property of my family, in the same beautiful place of our personal family holidays house (40 years we spend our holidays in ths magnificent place). U will be woke up by chirping of birds, surroundend by quietness and green, with deep blue sea in front of u (seaview both from terraces and bedroom's windows). Unique part of the Island where nature is still savage and uncorrupted. There are 2 bathrooms, one per floor. Due to space limits the (large) shower is separated. The third compelte bathroom & shower is within the dependance Torara. 4 gas ring coocking hob, electric oven, microwaves, coffee machine, moka, fridge&freezer, new and abundant pottery, cutlery and pots. 6 seats wooden table. Two wooden tables and benches in the half roofed lateral terrace. Private seaview terraces just for house guests. Front seaview terrace with table. Lateral seaview terrace with barbecue, table and benches, roof and deck chairs. Seaview both from terraces and all house's windows. Sunshine in the sea in front of the house (May-August). Past reviews perfectly describe this accomodation and place, we fully agree and subscribe. The place is something that can be dreamed and looked for long without having the luck to find it. That’s why we feel really lucky. We enjoyed every day of our stay having the most thrilling trekking and hiking we had ever just starting from the house. Nature is still the real owner of this place we were just visitors and we loved it. The house is warm comfortable and fully equipped, a pleasure to prepare meals and sleep in the silence with just light wind noise lulling u. Seaview from bedrooms is as amazing as rare. We definiteley recommend this accomodation to all and we are surely be back. Pleasant weekly stay. The house is comfortable and well equipped, seaview is the best we found ever. Location is exactly as well described in previous reviews. Satisfied. The house was functional, nice, clean, well mantanined, not de luxe (we did not look for and expect it in such place) but perfectly equipped and extremely comfortable for our group (6 guests). We also rented and used the beautiful dependance (twin bedroom with its own bathroom and shower) so we had 3 bedrooms and 3 bathrooms. Every bedroom has enchanting seaview from its windows as well as terraces. We had great barbecue dinners in the lateral terrace (table and benches are perfect for 6) looking at the sunshine in front of us. Surroundings are well described by other Reviews and we fully agree. Nature and quietness were so deep that we were bewitched by and, within the house itself, they made our holiday the top holiday we had ever. Childs still often talk about, it was a great experience for them and a joy for us to see them so absorbed to forget all the electronics and get deep in the "adventure" and freedom that this place allows them (and us). It made them grow up and they already ask to repeat next summer. We will surely satisfy them. Suggestions: bring snorkelling staffs, bring gym and rock water shoes and lot of sun cream. Abandon your car (except for shopping) and enjoy a paceful and relaxing stay. Explore surroundings following multiple paths passing near the house and do not forget to get a boat for rent (Sant'Andrea) and explore the still savage coast below. We have been easily met at the end of Via di Macairello by Mr. Marco and his wife, they drove us to the house and explained us everything. Perfect beginning. The enchanting beauty of this place and house surprised us. 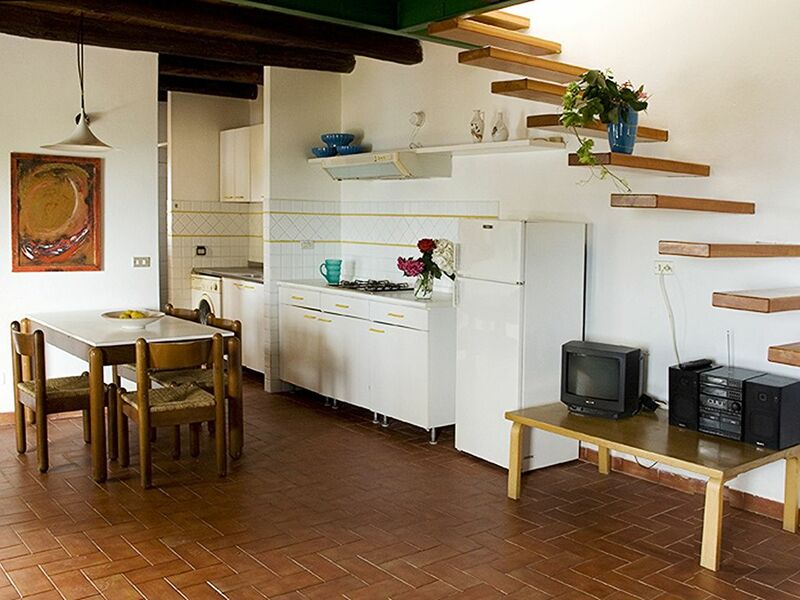 The house is comfortable and fully equipped (we loved to have a filter coffee machine, not usual in Italy), everything working and well mantained. External terraces are private, absolutely practical and agreable, overall the lateral one, half roofed, with wooden table and benches, a large stone barbecue and a superb seaview over the sea where the sun goes down into the water (spectacular sunshines). Seaview from everywhere but the most agreable was the one from bedrooms window, enchanting. The house is separated and lonely but not isolated: it is part of a cluster of houses on the top of a small hill facing the sea and surrounded by woods, reached by a small no exit road. The nature surrounding the house is great: yes the sea and seaside, but also woods, campaign and mediterranean maquis letting this place a piece of paradise for those who love nature and tranquility. During our two weeks stay we have been assisted by Mr. Marco and his wife. We did not need anything but they anyway sometimes came to visit us asking if everything was fine: we felt followed and cared. Finally we had great relaxing holidays in the nature, all our family was happy. We will surely come again in the future. We have been going to Elba for many years and since four years we have found the perfect spot in Andrea's house in Maciarello. We are a family of four (2 kids of 6 and 4) plus the grandparents and we normally rent the house and Torara. It's a 10 minutes walk down to the secluded beach of La Cala. We have kayaks and a small motor boat which we keep on the beach. By sea it's less than 10 minutes to reach Marciana Marina where we do the shopping (and we fish on the way there and back). There are numerous walks both towards Marciana Marina and S'Andrea. My husbands brings his bike and has been enjoying some good cycling around the island. It's the perfect location to have a quiet outdoor sea holiday and if you have a boat you can forget the car for the length of your stay. Previous reviews do a pretty good job at describing this property and its location, I can't add much more aside that I really really recommend it! Elba Island full Natural Park. On the coast between Marciana Marina and S. Andrea, 100 m over the front sea (magnificent lookout), mountains and forests behind, in a peaceful and bucolic context. Under the villa (7-10 minutes walk) there is a well known only on foot (or by boat) accessible beach named La Cala. Many other beautiful beaches can be reached starting from the villa with a nice walking through the typical Mediterranean vegetation. The location is also the ideal starting point for a wonderful trekking to discover lonely beautiful coves of the coast below or trough forests valley and mountains behind the house and also visiting old medieval villages of the area as Marciana, Poggio, St. Pietro and St. Ilario. Marciana Marina (15 min. by car) is a well known dressy small village, with its enchanting seaport and charming old village part (Il Cotone). Boat rental available both in Sant'Andrea and Marciana Marina as well as diving centers. Car/moto/bike rental in Marciana Marina. Ask the Owner for a precise quotation and additional full informative material. Website Pricelist is just an estimation based on 4 guests and average weekly (1 week) prices. Price can change according with specific week, Tenancy and guest's number (impossible to set a Pricelist taking in account all these variables). A comfortable 6 sleeps accomodation (3 double/twin bedrooms & 3 bathrooms) can be obtained adding the house dependance (named Torara, a double/twin bedroom with its own bathroom and shower). Ask the Owner for a precise quote (and additional informative full material). Prices are all-inclusive (no hidden fees, as final cleaning etc.). In order to avoid to my guests summer Saturday's 'nightmare' trips through old Italian roads and ports high season weekly changeover is usually on Sunday , when roads and ports are calm and gueste neither need to get ferry reservation (so they do not have to be at the Port "on time", they can take their time and get a less costly and relaxing trip). Low and mid season changeover can be agreed with the Owner (Saturday or Sunday).